On behalf of the NPI team, I’m pleased to announce that we have completed work tonight on a new release of Pacific NW Portal – Version 5.5, codenamed Waldport. Waldport is a maintenance release – the fifth in the Newport series. In other words, there aren’t any new major features… just bug fixes, updates to the index, and tweaks to functionality and branding to make things work better. Like every prior release of Pacific NW Portal, Version 5.5 is named after an Oregon coastal town. Waldport is located in Lincoln County just over fifteen miles south of Newport. The town is home to 2,033 people and is one of just seven incorporated cities in Lincoln County. It is situated alongside of Alsea Bay. 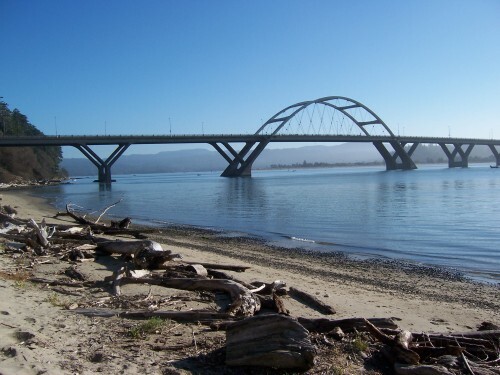 The Alsea Bay Bridge carries U.S. 101 over Alsea Bay and into Waldport, Oregon. (Photo by Koocheekoo; reproduced under a Creative Commons license). This post constitutes our official changelog for Version 5.5. Please feel free to leave questions, suggestions for future versions, or other thoughts on Waldport in the comment thread. Content delivery network deployed. To further increase Pacific NW Portal’s speed (the theme of the Newport series) we’ve begun deployment of a content delivery network, or CDN. Our new CDN serves images and scripts to Pacific NW Portal through a subdomain (media.nwportal.info) using multiple datacenters. This is an under-the-hood enhancement and doesn’t affect the way that Pacific NW Portal looks. Misconfigured newsfeed recalibrated. One of the local newsfeeds on the Washington Outlook page – specifically, the Everett newsfeed – contained some outdated template tags that were distorting the appearance of the feed. (All of the hyperlink tags were broken!) We have fixed this. Oregon Transportation Alerts feed fixed. We have rebuilt and reprogrammed the Oregon Transportation Alerts feed on the NW Life page. The feed now displays alerts and project updates from ODOT like it’s supposed to (it had recently ceased functioning). We’ve also enhanced the feed so it pulls posts from the Willamette Bridge construction blog as well as photos from ODOT’s Flickr photostream. Temperature reader now working consistently. The script that retrieves the latest temperature reading from NWS’ weather station at Seattle-Tacoma International Airport had been functioning erratically because the automated process that runs it couldn’t locate all of its dependencies. We have explicitly defined all the dependencies, and now the reader works 100% of the time. Screenshots are current. We’ve replaced the example screenshots on the Toolkit page with images that depict the current version of Pacific NW Portal – this release (5.5). The example screenshots show how Pacific NW Portal is supposed to look on different platforms. Enhanced local newsfeeds (experimental). We’re experimenting with incorporating press releases, newsletters, and alerts created by city governments into the local newsfeeds found on our state pages. The idea is to make the local newsfeeds more comprehensive. That does it for this release. If you have thoughts on any of these changes, or ideas for future improvements that you’d like to see, leave a comment in the thread.